Hospitals tend to fall into a special category when it comes to car parking problems and solutions. Many new hospitals built in what were sparsely developed areas in the mid-20th century now find themselves trapped by decades of urban development. Because a central, easily accessible location is vital to the services they provide, moving to a more distant area is not usually a viable option. Urbanization means that the size of the population in the community they serve has probably more than tripled since the doors opened for the first time. The level of medical intervention has increased substantially over the decades, and in many countries, hospitals have been consolidated into fewer but larger facilities while the available land has not increased at all. Decades of increasing motorization results in visitors and employees needing ever more parking spaces. Moreover, the growth in outpatient services adds even more pressure to the parking shortfalls many hospitals are currently experiencing. Very efficient use of scarce land is a necessity. Making tradeoffs in land used for healthcare facilities and land needed for car parking is difficult and sometimes impossible. Nonetheless, car-parking problems affect both the hospitals' profitability and customer satisfaction. Appointments missed because people can't find parking in a reasonable time increase service inefficiencies and patient backlogs for the hospital. Missing appointments because of hospital parking problems present serious issues for patients: rescheduling, lost time, extra transportation costs, delays in getting care, etc. Automated parking systems (APS) make the most out of your precious land by minimizing the area needed to park a car. Furthermore, APS are very flexible in terms of shape, size and application…even turning otherwise unusable areas into convenient car parking space. Inherently safer than other parking solutions, APS are also very convenient for drivers and passengers with mobility challenges. 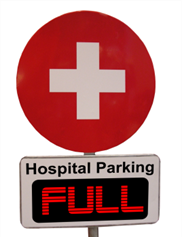 See if an APS is the right solution for your hospital parking needs… contact Skyline Parking.